HOUSTON (AP) -- Jeremy Lin doesn't know if he'll ever perform as well as he did during his charmed February with the New York Knicks last season. For now he's content to be a key contributor on his new team. James Harden scored 33 points and Chandler Parsons had a career-high 31 to help the Houston Rockets coast to a 131-103 victory over the Knicks on Friday night. Lin added 13 points, seven rebounds and three assists in his first game against his previous team. The Rockets carried a 12-point lead into the third, and scored 10 straight points later in the quarter to extend their lead to 21. Carmelo Anthony scored a season-high 37 for New York, which has dropped consecutive games for the first time this season. Lin went undrafted out of Harvard and became a sensation with the Knicks last season with a remarkable stretch in February when he scored at least 20 points in nine of 10 games. A high point of that span came when he had 38 points and seven assists in a 92-85 victory over the Lakers on Feb. 10. 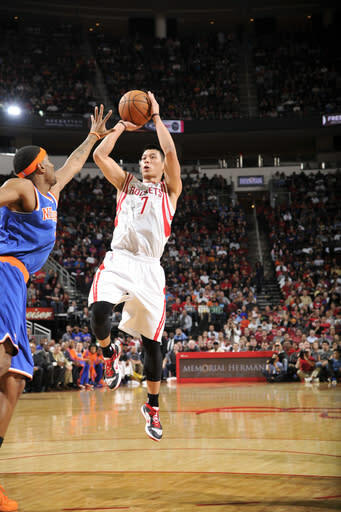 The Rockets released Lin before he signed with New York. 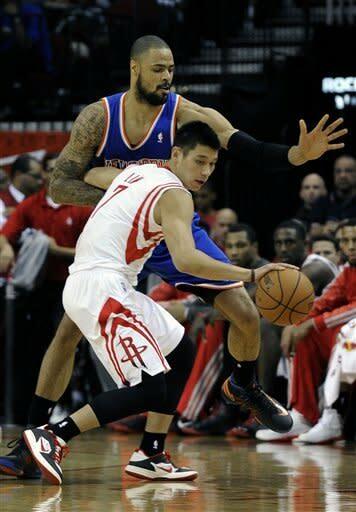 Lin became a Rocket again when the Knicks decided not to match Houston's three-year, $25 million offer. He said he's ''at peace'' with the Knicks not matching Houston's offer, and he's glad to be in Houston. He'll get another shot at his former team when the Rockets travel to Madison Square Garden on Dec. 17. Though Lin and the Rockets got the best of the Knicks in this one, not everything went right for the guard on Friday night. ''I lost part of my tooth on the floor,'' said Lin, who chipped one of his front teeth while scrambling for the ball near the end of the first half. Parsons scored 26 points in the first half to surpass his previous career high of 25. The second-year player went 8 for 8 to pile up 18 points in the first quarter. He finished 13 of 17 with four 3-pointers. Harden, who had nine assists, was a career-best 16 of 16 at the free-throw line to help Houston build its big lead. Houston (6-7) set a season high for points and it was the most New York (8-3) has given up this season. Houston was up by 10 before going on a 11-0 run, capped by a 3 from Lin, to stretch the lead to 94-73 with about five minutes left in the third quarter. Anthony got a technical, and Tyson Chandler received a flagrant foul on a play where he and Omer Asik were jostling for a rebound in that span. Asik had Houston's next seven points before Toney Douglas sunk a 3-pointer at the buzzer to leave the Rockets up 104-80 entering the fourth. The Knicks made just two field goals and had four turnovers in the last eight minutes of the third. The Knicks used an 11-2 run to cut the lead to 51-50 about 5 1/2 minutes before halftime. A 16-3 spurt by the Rockets, powered by seven points from Harden, put Houston back on top 67-53 with less than 2 minutes left in the second quarter. 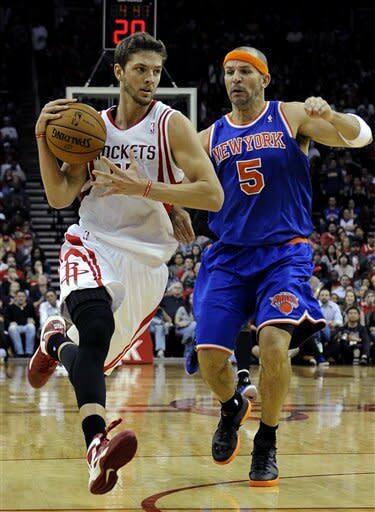 Parsons sunk a 3-pointer about a minute later to push Houston's lead to 72-57 at halftime. Marcus Morris was shaken up with about a minute left in the first quarter fighting for a rebound with Anthony. He fell to the court where he remained for a couple of minutes. He was eventually helped to his feet and taken to the locker room. He returned to the bench with about 11 minutes left in the second quarter and returned to the game about 6 minutes before halftime. NOTES: Sampson said before the game that there is no change to the family situation that has kept coach Kevin McHale away from the team since Nov. 10. ... New York F/C Rasheed Wallace missed the game because of a sore left foot. 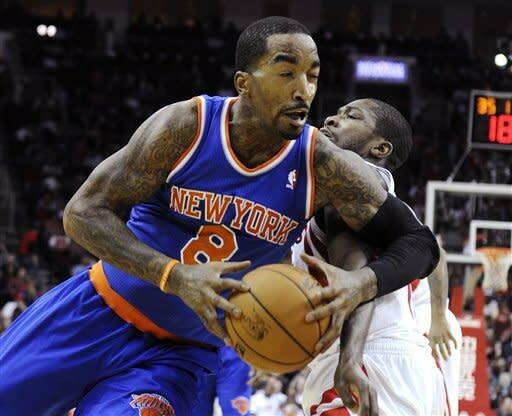 ... Houston has won eight straight over New York in Houston and six overall against the Knicks.